Munnar is one of the most beautiful hill stations in India. The highest peak in South India, Anamalai, is situated in these range of hills. Munnar hills are part of Western Ghats, a UNESCO World Heritage Site. This picturesque hill station is known for its rivulets, tea plantations and colonial bungalows built during the British rule in India. The word Munnar means ‘three rivers’. River Muthirapuzha, River Nallathanni and River Kundala confluence at this serene hill station. Eravikulam National Park is a nearby wildlife Sanctuary worth visiting. Rajamala (King of Hills) is situated inside Eravikulam National Park. Rajamala is at around 15 kilometers distance from the Town, on your way to Anamudi. Anamudi is the highest peak in South India. Anamudi is located inside Eravikulam National Park. Its is also home to a large number of ‘Nilgiri tahr‘ (Hemitragas Hylocres), a rare mountain goat, which is in the extinct list of animals. Half of world’s ‘Nilgiri tahr’ is found in Rajamalai. 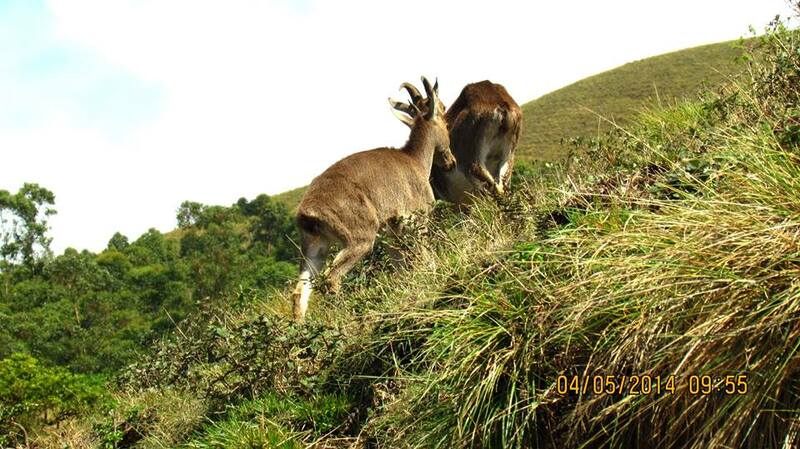 You can see them roam around the steep hills, at a very close proximity, on the roads inside Eravikulam National Park. Approximate number of Nilgiri tahrs at this area is 1300. It is locally known as Varayadu. Neelakurinji (Strobilanthes Kunthianus), a shrub which flowers once in 12 years, is found here in this national park and its surrounding areas. The flowering started in August 2018 and is coming to an end in October 2018. Neelakurinji flowering areas were declared as “Neelakurinji National Park” by the state government in 2006. It is known as ನೀಲಕುರಂಜಿ in Kannada, குறிஞ்சி in Tamil, നീലകുറിഞ്ഞി in Malayalam. Power House Waterfalls originates from Sita Devi Kulam’. It is believed that ‘Sita’, wife of ‘Raman’, the hero of the great Hindu epic Ramayana, used to bath here in this lake. It is situated at Chinnakanal, at around 21 kilometers from the heart of the city. Some of the other places to visit in Munnar are listed below. There is a flower garden maintained by Kerala Forest Development Corporation Ltd (K.F.D.C.) near Munnar town. Blossom park near old Munnar town is also a beautiful tourist destination. Top Station, known for the picturesque view of the hills, is at around 30 kilometers distance from town, on the Munnar-Kodaikanal road. The village Ellapatti, en route to top station is famous for vegetables like carrot, beans, cauliflower, cabbage, etc. You may buy these vergetables here. Meesapulimala is just opposite to this village and the view is excellent. 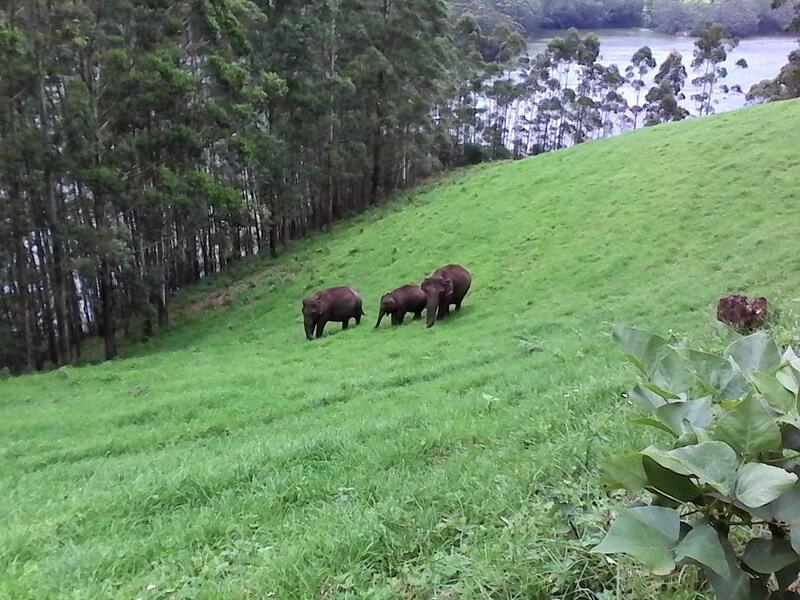 Anayirankal (the word means elephants comes down) is another beautiful place, where herds of wild elephants can be seen roaming around in the slopes of the mountain ranges. Kundala Dam is situated at around 20 kilometers from Munnar town, on your way to Top station. Boating facilities are available in this dam. Lake Kundala is on one side of the dam. It is the the first arch dam in Asia. Aruvikkad Waterfall is situated near to this dam. Yellapetty Tent Camp is one of the best private tent camps near Munnar. It is situated at around 6-7 kilometers from Yellapatty Post office. Yellapatty Post office is on the Munnar – Top station Road. entry fess is Rs 2500 per person, as on March 2019. They offer trekking to nearby beautiful hills covered with mists. Sunrise and sunset can be seen from here. Overnight stay with campfire at the tents is also part of the package. They can be contacted on telephone number +91 96339 96929. Pallivasal, Kerala State’s First Hydro-Electric Power Project, is at around 10 kilometers distance form the town. “Sethuparvathy Dam“, part of ‘Pallivasal Hydro electric Project’, is another tourist destination, where boating facilities are available. Iduky dam, the largest and the oldest arch dam in India and the third largest in the World, is around 1.5 hours drive from this town. Munnar is one of the best Kerala tourism destinations. How Do I Go to Munnar in Kerala? Madurai airport is the nearest airport at around 160 kilometers from this hill station. Cochin International Airport, at Nedumbrassery near Cochin (Kochi), is another nearby airport. Munnar is around 4 hours drive from Cochin. Theni railway station is the nearest railway station at around 75 kilometers distance. Angamaly railway station is at around 100 plus kilometers distance. Kottayam Railway station is at a distance of around 145 kilometers. It takes around 3 hours drive from this beautiful hill station town to reach Kottayam. Munnar is well connected by roads to Kottayam, Ernakulam, Thekkedy in Kerala. Cities in Tamilnadu like Kambam, Theni, Dindigul, etc, are also well connected by bus services. Which are the Best Munnar Hotels and Munnar Resorts? Tea County is one among the good hotels run by Government of Kerala’s tourism department, KTDC. Eastend is another one among the good hotels in the center of the town, offering 4 star facilities at affordable rates. Club Mahindra resorts is one of the best Munnar resorts having a large property at a vantage point in Munnar. Ayur County Mountain Resort is at Chinnakanal, Munnar. Carmelia Haven is another good resort; an Eco-friendly resort in the middle of cardamon, pepper and tea estates. It is one of its kind in the state. Carmelia Haven is at Vandanmedu, at around 68 kilometers from Munnar on Munnar- (Kumuly) road. Kumily is at around 23 kilometers from this resort. Apart from regular rooms, Carmelia Haven has a tree top house and an underground house (cave house). Cloud farm is a much soughtafter camp site near the Top station. Mar Thoma Retreat center (under Malankara Mar Thomas Syrian Church) also has rooms for rent. Contact numbers are +91 4865 208399/ 232289/ 232290/ 232285. Sree Mahaveer Jain Restaurant (Near Sterling resorts) and Purohit Restaurant (Tea County Road, Ikka Nagar) are two good North Indian restaurants at Munnar.